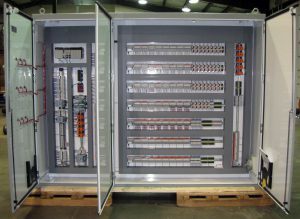 IPS recently stepped in to design and fabricate a large, complex PLC panel used to control the Dry Grinding operation at a large-scale, high-density wood pellet production facility. Wood pellets are still big business; according to Forbes, global revenues from biomass power generation could reach $11.5 billion annually by 2020 as global regulations demand less fossil fuel consumption. This panel consisted of an 86-inch by 112-inch by 20-inch NEMA type 4/12 enclosure. IPS worked with EAD Engineering to determine the correct components, not just for the project’s needs, but to also provide for future expansion. We equipped the control panel to handle a total of 544 I/O points.